New item in original packaging. 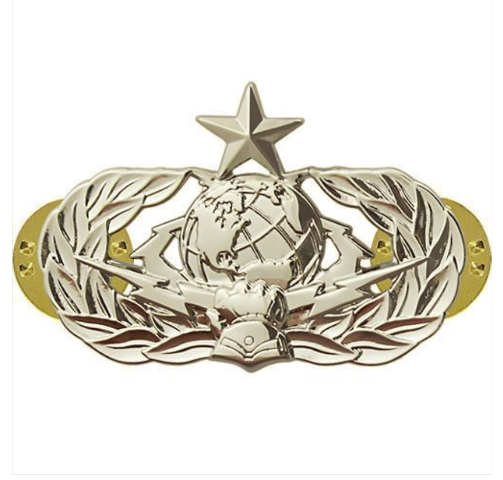 Air Force badge midsize mirror finish Cyberspace Support: Senior. The Cyber Mission's purpose is to prevent outside invasions and keep our nation safe and secure by doing so. It covers Cyberspace Operations and Cyberspace Systems, proving to be a critical component of modern combat. Cyberspace Operations involve the design, installation, and support of advanced software and computer systems, while Cyberspace Systems include using all systems to support planned and strategic operations. Because of the rapid advancement of this field, the Air Force Reserve is seeking more tech-savvy airmen than ever before. 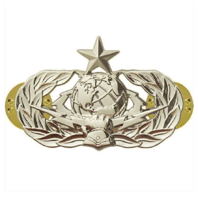 Air Force badge regulation mirror finish Senior Cyberspace operator. Certification Level 2 - Completion of Cyberspace 200 professional continuing education course, completeion of job-related training and at least 6 years experience in cyberspace billets.